Greening early childhood education (ECE) means giving preschoolers the gift of Nature. It's that simple! We believe that preschool and kindergarten ("children's garden") is the best time to help children awaken their innate connection with the rest of Nature. Indeed, our whole Green School Curriculum Model grows out of nature bonding for young children. What would happen if the young child went forth some part of every day, forth into the nearby natural world, into the woods and meadows, along paths and streams, in rain or shine, tromping though mud and snow. Would it make a difference in her learning, her health, her happiness? YES! say teachers of nature preschools and forest kindergartens. Since the European concept of forest kindergartens and nature preschools arrived in North America, more and more resources have appeared online. 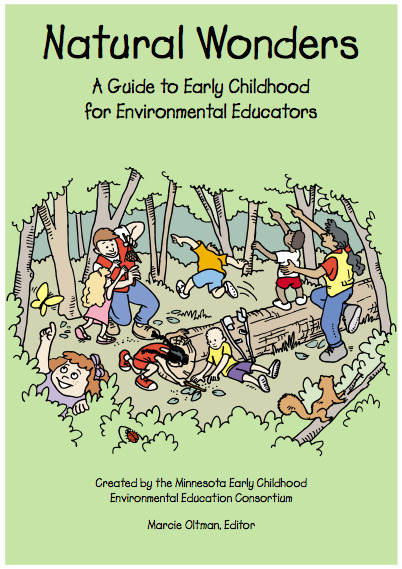 Not a guide to environmental education for preschool teachers, but a guide to early childhood for environmental educators, Natural Wonders by the Minnesota Early Childhood Environmental Consortium, provides sections on understanding how young children learn best, planning and supporting active learning, and developing and evaluating developmentally appropriate programs. Early Childhood Environmental Education Programs: Guidelines for Excellence by the North American Association for Environmental Education, has chapters on program philosophy and purpose, developmentally appropriate practice, play and exploration, places and spaces, educator preparation and more. Forest School Canada offers Forest and Nature School in Canada: A Head, Heart, Hands Approach to Outdoor Learning, which includes an overview and definition of a forest and nature school, learning approaches (including inquiry-based, play-based, place-based, experiential learning and emergent curriculum), practical considerations such as risk assessment, and resources to get you started. I took the Forest and Nature School Practitioner course offered by Forest School Canada in the summer of 2014 and highly recommend their work, especially if you're seeking more experiential ways of greening early childhood education. 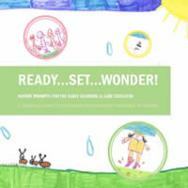 Toronto's Humber College, in partnership with The Back to Nature Network, developed Ready...Set...Wonder! to assist early childhood education professionals in providing opportunities for children to connect with nature on a regular basis. It's a practical guide that provides a large number of simple (and easy to introduce) nature prompts for the early learning and care educator. The experiences are colour coded according to weather conditions, which is pretty handy! Greening early childhood education also means providing environmentally healthy learning spaces. Children's Environmental Health Network provides the Eco-Healthy Child Care® endorsement for childcare centres that meet a number of best-practice criteria for environmentally healthy learning settings for young children. Their checklist of 30 easy-to-follow steps can be found here. When did parents and caregivers become so afraid to let young children do what young children have done for millennia — explore the natural world around them? Skinned knees and "soakers" and falling off the swings or out of trees used to be a normal part of childhood. Now it seems that mollycoddling and overprotectiveness are the norm. Sadly for the children, they're growing up not realizing that life is a contact sport! In North America at least, we're experiencing an epidemic of childhood obesity, childhood type II diabetes (they can't call it "adult onset diabetes" anymore), childhood depression, and a spate of behavioural issues. Let's let the children play outdoors and take a few risks, along with a few bumps and bruises! 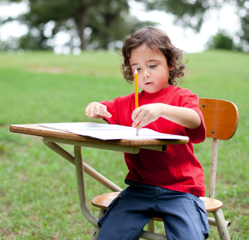 Learning and growing and developing are all associated with risk-taking. Having said that, there are ways to "manage" risk while measuring its benefits. According to Britain's Health and Safety Executive policy called Children's Play and Leisure, "When planning and providing play opportunities, the goal is not to eliminate risk, but to weigh up the risks and benefits. No child will learn about risk if they are wrapped in cotton wool." The way we're treating children isn't conducive to raising kids that are going to be independent and able to get out in the world and manage risks for themselves. We need to lighten up a bit and think about the downside of too many rules. The key is to distinguish between hazards — unexpected dangers that kids can't be expected to consider — and reasonable risks, making things as safe as necessary, but not as safe as possible. While we're talking about age- and developmentally appropriate risk-taking, please let's remember that being too clean is impairing children's health. As reported in the Telegraph, children who aren't allowed to play in the dirt won't be as healthy as their peers who play (and learn) outdoors. Exposure to dirt and germs during early childhood can prime the immune system to prevent allergies and enhance the body's ability to heal. Children learn better outside than indoors because the capacity for joy is greater outdoors. Greening early childhood education means, if you're the parent of a young child, taking your child outdoors every day. And if you're the caregiver of young children, please, take those children outdoors to play. Mother Earth delights in holding our young ones in her loving green arms.